One week from today,on May 28th, my little buddy Emma, her mother, and I will be taking part in a wonderful charity walk event and could use your help! 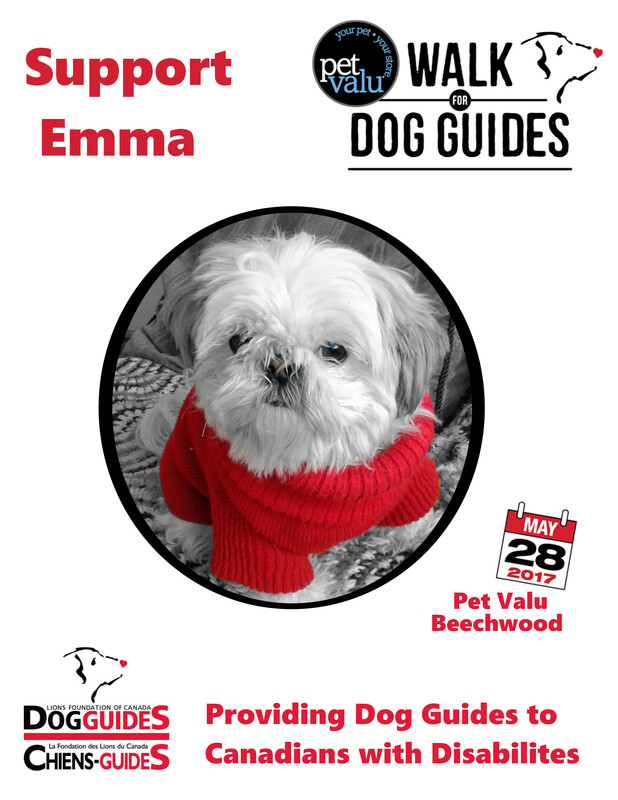 For more than 30 years, the Pet Valu Walk for Dog Guides has been a vital national fundraiser in support of Lions Foundation of Canada Dog Guides. Taking place in more than 240 communities across Canada, the Walk raises funds to provide life-changing Dog Guides to Canadians with physical and medical disabilities at no cost to them. We will be participating in the Pet Valu Beechwood walk from the store to Stanley Park. It’s a pretty fair distance to walk when your legs are only four inches long like Emma. So far, with in person donations, we’re a little past half way to our goal of $200. Any sponsorship donations would be greatly appreciated and can be done online on our Walk Page (under Del Roba). Donations raised go towards raising and training of these dogs. Each dog costs roughly $25,000 CAD to raise and train. They are provided to those who need them for NO COST.